Drugs used to treat fleas. Flea infestation is the commonest disease treated at Vetrica. Fleas are probably the most significant source of suffering for dogs and cats. All dogs and cats should be protected from flea infestation. Dog and cat fleas will happily live on both dogs and cats. In fact, the most common flea species found on dogs is the cat flea. The likelihood of finding a particular species of flea on a dog or cat is more likely due to geographical location rather than preference of the flea for dogs or cats. It is best not to think of fleas as either dog or cat fleas in this respect. Adult fleas generally live on an animal, but can survive for a short time in the environment. When on an animal, they feed by sucking blood from the animal’s skin. They do this by inserting their long mouthparts into the skin, followed by the injection of saliva, (this prevents the animal’s blood from clotting inside the flea’s mouthparts), and then sucking the blood. The injection of saliva is responsible for most of the symptoms of flea infestation (see below). Adult fleas mate on the animal, the female laying hundreds of eggs. These eggs (which are too small to see) are not sticky; they are smooth, allowing them to fall off the animal all over its environment. Anywhere an animal with fleas spends much time will have hundreds or possibly thousands of flea eggs. Flea eggs hatch into flea larvae. Flea larvae look like microscopic caterpillars, and quickly wriggle away from the empty shell, trying to get away from the light. The larvae feed on environmental debris, but especially adult flea droppings. When fully mature, the larvae pupate, by spinning a cocoon. The cocoon is like a hard shell, and very effectively protects the larva as it develops into an adult flea. Whilst in the pupa, which can be for a year or more, the larva is protected against most environmental insecticides. On hatching, the young flea jumps onto the first animal that passes. It quickly feeds, and starts to mate with other fleas, completing the lifecycle. The time from an egg being laid to an adult flea hatching from its pupa can be as little as 12 days under optimum conditions. The most common problem is flea bite hypersensitivity. This occurs because of the way fleas feed. Flea saliva contains a variety of different proteins. When it is injected into an animal’s skin, these proteins are recognised as “foreign” by the animal’s immune system, which in turn leads to an immune response. The inflammation that results is what we would classically call a “flea bite,” and is intensely itchy. This is why animals (and people) that are bitten by fleas will scratch. In cats, itch generally results in an increase in grooming behaviour, rather than scratching with the feet as is seen with dogs. As a result, the main symptom in cats is hair loss, which can be spectacular. Some cats are so itchy that they groom off every hair that they can reach. Not every animal that is bitten by a flea reacts in the same way, and many (especially cats), are not bothered in any way. This is why some animals with heavy flea infestations have no symptoms at all. Cat and dog fleas do not generally live on people. However, particularly in heavily infested environments, fleas will occasionally bite humans. Flea bites occur most commonly around the ankles, and the wrists. Bites result in raised, circular red spots, that are extremely itchy. As time passes the central skin of the spot dies and flakes off, leaving a small hole. There is no requirement to treat people when their pets have fleas. Simply treating the animal (and the environment), is sufficient. How to tell if an animal has fleas. The easiest way to tell if your pet has fleas is to look for flea droppings (faeces). These appear as black specks of dirt in the hair coat. The photograph on the left shows flea droppings on a piece of paper. If you see these on your pet, he has fleas. Adult fleas are less commonly found. In dark haired animals, it may be necessary to use a flea comb to find the droppings. 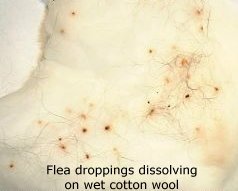 When placed onto a piece of wet cotton wool, flea droppings dissolve as a reddish-brown stain, as shown by the photograph on the right. Nothing else does this. The best areas to look for flea droppings are the rump, around the neck, and underneath the animal’s tummy. Flea infestation can be extremely difficult to prove, especially in cats. Normal cats groom themselves every day, and when they do this, they remove adult fleas, and their droppings. Some cats that are suffering from flea bite hypersensitivity will groom themselves so much that they remove all of their hair. Along with this they remove all of their fleas, and droppings. Hair loss is a very common reason for bringing a cat to the vet, and in most cases, this is due to fleas. There are many drugs available in the UK to treat fleas. At Vetrica, we use what we believe to be the most effective, or easiest to use. There are two broad types of flea treatment: those that kill adult fleas; and flea contraceptives. Drugs that kill adult fleas. This is available as a spray or a spot-on, and is suitable for use in both dogs and cats. It is very long lasting, and very effective. One spot-on application kills fleas on dogs for 2 months and cats for 5 weeks. The spray is even longer lasting, (3 months for dogs and 2 months for cats), much cheaper, but much less pleasant to use. Both the spray and spot-on are waterproof. 48 hours after application, it is safe to bath or shampoo dogs and cats, and it will not wash off. After Frontline has been applied, it spreads to cover the entire body surface, and kills fleas by contact, which means they don’t have to bite the animal to die. Frontline has an excellent safety profile (although it should not be used on rabbits), and in most cases is our recommendation for the treatment of active flea infestations. Capstar is an oral insecticide. It is very fast acting – fleas start to die within 15 minutes of administration, and most are dead within a 2-3 hours. Capstar is inexpensive, but unfortunately very short acting. After 24 hours, any fleas arriving on the animal may be unaffected. At Vetrica, we use Capstar mainly as an adjunct to Program, or where very fast action is required (such as catteries, kennels or grooming parlours). It is safe to use on animals that are both over 4 weeks old, and more than 1kg in weight. Program is available for cats as an injection or liquid suspension for mixing with the food; or as a tablet for dogs. The injection provides cats with 6 months continuous protection. When given orally, Program lasts for 1 month in both dogs and cats. Being a flea contraceptive, it works by preventing the build-up of fleas by stopping flea development. Program is also available as Program Plus. This is a tablet available for dogs only, and has a good effect against intestinal worms. Program mimics the action of a hormone found in flea larvae and eggs. Fleas that have been in contact with this drug will not produce eggs capable of developing into adult fleas. 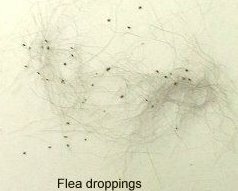 Additionally, flea droppings produced by these fleas contain the drug, and any flea larvae consuming these droppings will not develop into adult fleas. This product works extremely well in most cases, but should be regarded as a preventative medication rather than a treatment. Where adult fleas are present on your pet, a treatment capable of killing adult fleas should also be given. Flea shampoos kill any fleas that are present on the animal at the time of bathing. However, all the insecticide is immediately washed off, and a nice clean animal is then re-infested with fleas newly hatching from their pupae. Flea shampoos are not an effective means of flea control. Pet shop, and supermarket spot-on flea control products are generally ineffective and expensive. We frequently see fleas on animals that have been regularly treated with these products. Flea collars are not an effective means of flea control. We see many cases of fleas in animals with flea collars on. (For outdoor cats, a reflective collar is a much more worthwhile item). Flea powders are messy and of short duration of action. During use, the powder tends to float off into the atmosphere, and it is very difficult to avoid breathing it in. Very frequent re-applications are required. Flea powder is not an effective means of flea control. 95% of the flea burden of an animal is present in its environment. This means flea eggs, larvae, pupae and adult fleas are present anywhere the animal goes. Areas where high numbers of fleas will be found are in bedding, carpets, furniture, especially where an animal spends a lot of time in one location. For optimum flea control, if you see fleas on your pet, you should treat the environment as well. Most environmental flea control products available today are insect growth regulators, similar to the flea contraceptive discussed above, and most also contain a short-acting adult flea killer. When sprayed onto an animal’s bedding, furniture etc, any adult fleas present are killed. Any larvae or eggs can’t develop, and die as a result. Pupae are resistant to both these chemicals. A pupa can remain dormant for up to 2 years (although mostly less than one year), and it is for this reason that fleas so regularly re-appear when people stop using flea control, after their pets apparently become free of fleas. Typically, depending on the brand of environmental agent used, adult fleas are killed for about a week after application. Vacuuming before application stimulates the flea pupae to hatch, (the vibrations caused by the vacuum cleaner mimic the presence of an animal). So, if you have a flea infested pet, you should always vacuum first, (sucking up fleas, pupae, larvae and eggs), empty the vacuum cleaner outside, then apply the environmental agent. Hopefully, this will stimulate most of the remaining pupae to hatch and be killed by the short-acting adult flea killer in the treatment. The insect growth regulators present in most brands last for at least 6 months. Fleas are a major cause of suffering in dogs and cats. Unless steps are taken to prevent it, most cats with access to outdoors will get fleas. Dog and cat fleas are essentially the same. Regular treatment with Program or Frontline will stop your dog or cat from ever having fleas. Where a flea infestation is present, also use an environmental spray. No flea product will kill fleas before they bite. Other insects also spread myxomatosis (e.g. mosquitos). Fleas are much easier to prevent than eliminate, so the simplest way to ensure that your dog or cat does not get fleas is to start using an effective method of flea control before you see fleas. This applies all year round, because the increased use of central heating allows a suitable flea development environment to be present all year. We see active flea infestations every month of the year at Vetrica. 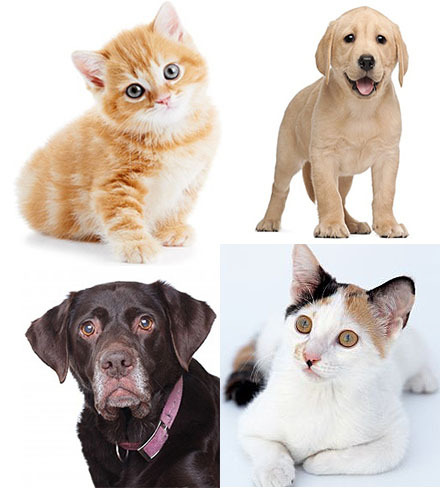 For cats or dogs that are currently free of fleas, the use of Program is most appropriate. In the case of cats, a once every 6 months injection of Program is the simplest, most convenient method of flea control. In fact, after six months correct use of Program we guarantee your pet will be free of fleas. (Read more about the Vetrica Flea-Free Guarantee). Administer Capstar – This kills all the fleas on the animal now. Apply Frontline for 2-3 months – This kills the majority of newly hatching fleas. Treat the house with an environmental insecticide – Prevents further flea development in your house. Start Program to guarantee long-term freedom from fleas. Remember to treat all dogs and cats in the household.